Jackie Stewart is a legend, possibly the greatest F1 driver to have ever lived. Not only did he come away with three championships to his name, he revolutionized the sport pushing for safety. 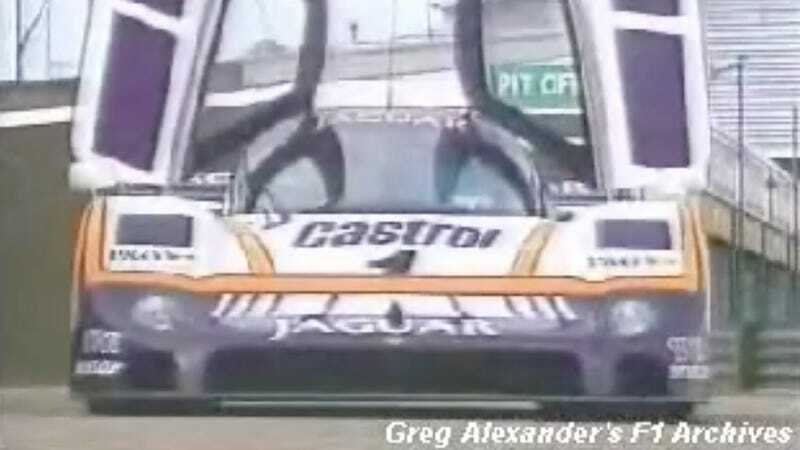 He was always well-spoken, too, and that got him the opportunity to test and review a number of cars, including the Le Mans-winning Jaguar XJR-9. But Jackie and the Jag did not get along. Please do enjoy this video for a wonderful demonstration in how racing driver might be good drivers, the best drivers, but they crash. Oh, they do crash indeed. In any case, Jackie starts off this review as only he could: complaining that there is no grip tape below the pedal box so it makes it easy for his feet to slip, and then complaining about the car’s poor handling. The problem is that the XJR-9 made do with an extremely tuned version of Jaguar’s top road car engine at the time, which was a physically vast V12. The car was short. The engine was long. Though it has a midengine layout, Jackie explains, it feels like a rear-engine car, the back leading the front. And so it leads him right into a tire wall. Well, that’s fine. After all, in racing, if you’re not crashing, you’re not trying.